I found some questions like that here but it doesn't help me. 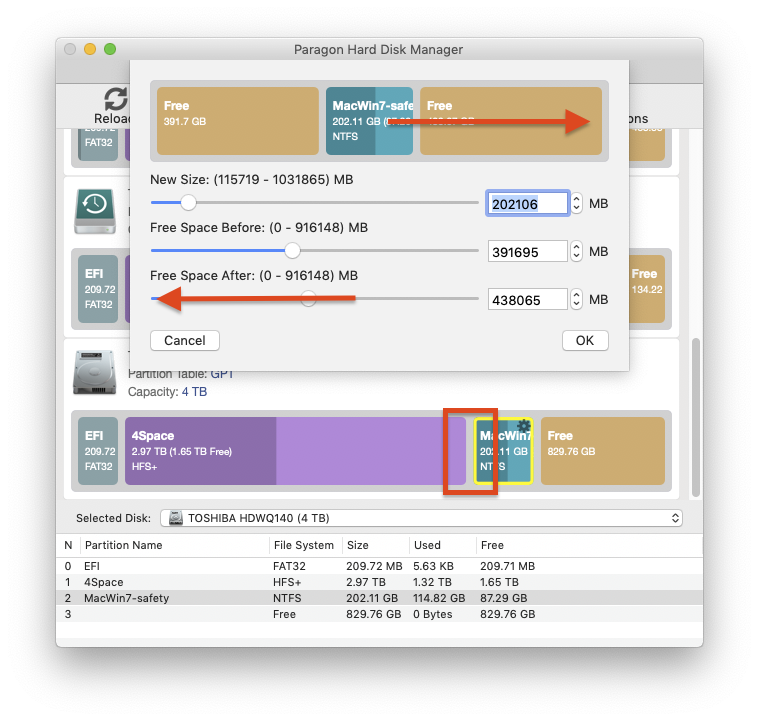 I use Paragon hard disk manager & disk utility to resize it and have screenshot like below. But I can't add free space to main osx partition. I found that I have to move free space section to near main partition so I can able to resize it. Don't even start this without a solid backup. Right click the NTFS partition & select Move/Resize Partition. Drag the Free Space After slider all the way to the left. This will move the NTFS partition to the end of the disk & the free space into the area outlined below, between the APFS container & NTFS partition. This should then consolidate your free space. Volumes on APFS containers will not show as filling all the available space, due to their 'live expandability' feature, even though the container itself does. I don't have an example with APFS & NTFS to show, but this is my 1TB SSD which shows as having 456GB 'free' at the end whereas the container itself & in the Finder the Volume is actually [almost] the entire 1TB. So, to complete your changes, you need to select the APFS Container [not the Volume on it] & again using Move/Resize Partition, change the New Size until it fills your moved Free Space. Remember to Apply Operations afterwards. Note: This is likely to be a very long, slow operation; whilst potentially a lot faster on SSD [on which I have never actually tried to do a data move of this size] on HD I'd expect to come back to it in the morning, so make sure you have plenty of time & keep the Mac on mains power. I don't have my computer working to follow along with my answer right now, but I'll try to do this from memory. When they say free space before and after, they aren't referring to before and after the operation, they are referring to before and after the selected partition. Important! Try the solution that I put at the bottom of the answer first, if it works it'll be the lease messy solution. Or, (this can probably be done) don't delete the 50gb free space partition, and just drag it to the left. 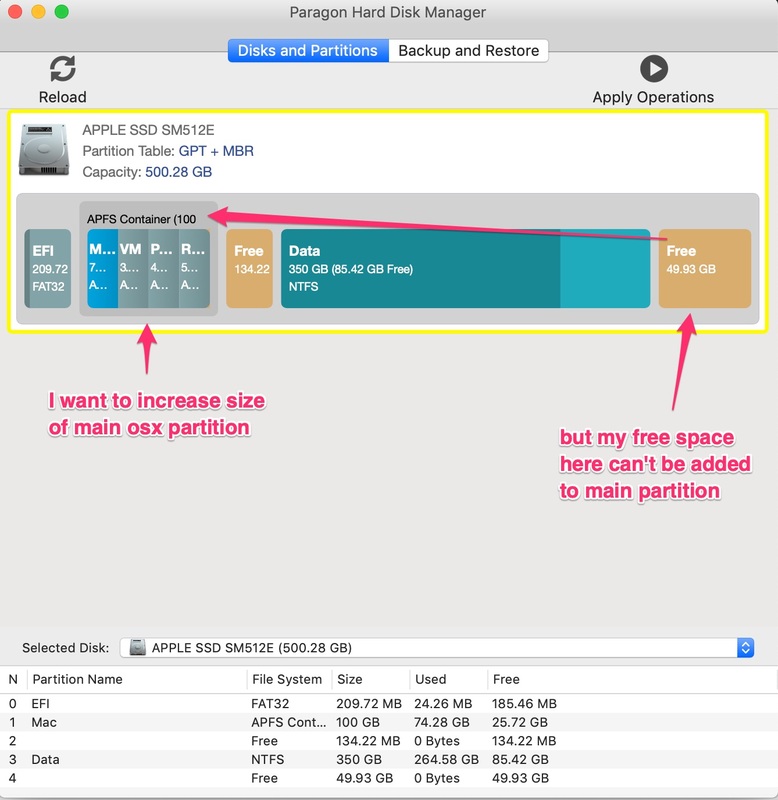 I don't know off of the top of my head how to merge partitions, but with the free space next to it, it will probably just let you increase the partition size. To do this though, you have to be looking at the size adjustments for the macOS partition, not the free space one or the windows one. Not the answer you're looking for? Browse other questions tagged hard-drive disk-utility partition mojave .